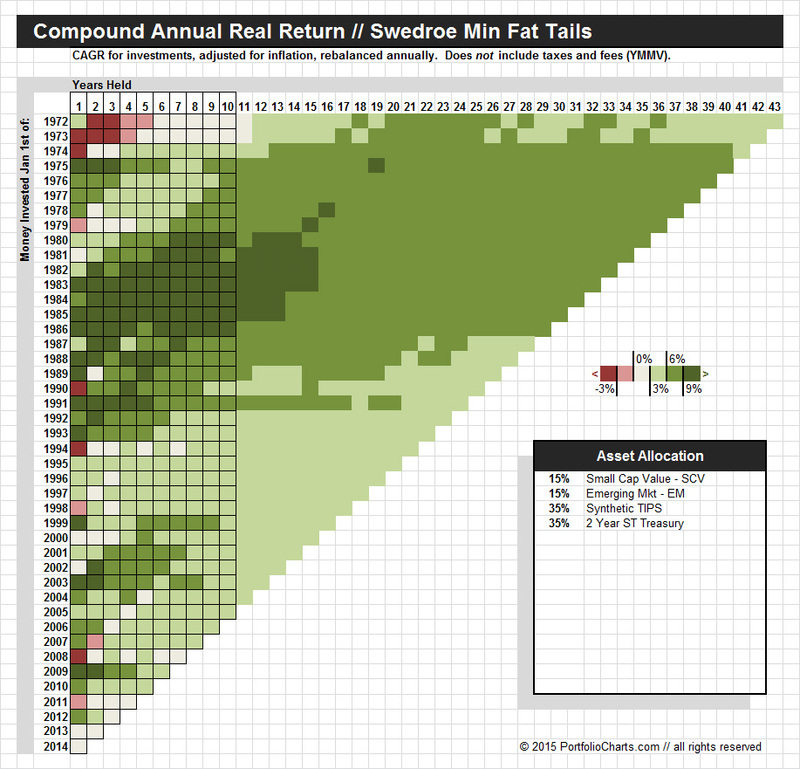 I added a new lazy portfolio to the list — the Swedroe Min Fat Tails. I’ve always been a fan. However, when studied through the calculators here it demonstrates a few characteristics that I’d like to point out to help explain how to look at the charts in unison. First, take a look at the Funnel chart. This is a good example of how sequence of data can sometimes lead to some potentially deceptive conclusions. 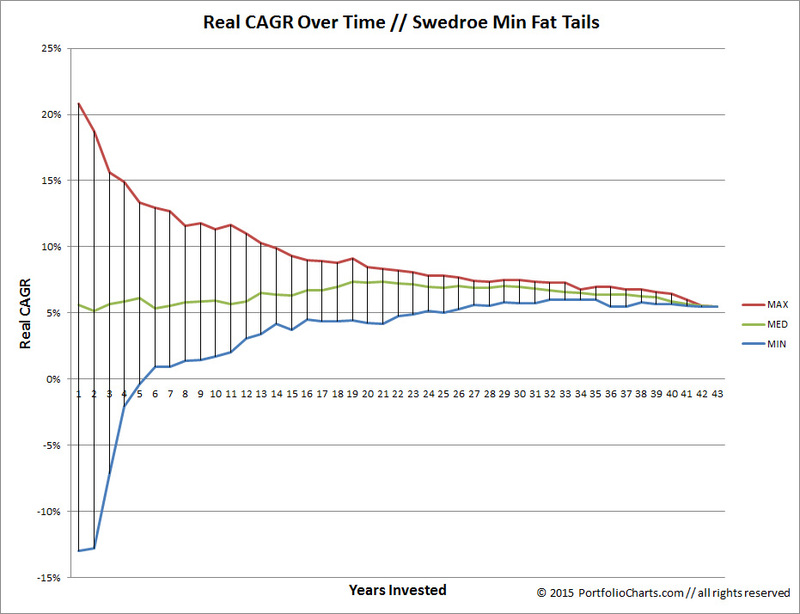 Note how the median CAGR starts around 5.5% for shorter durations, peaks at about 7.5% near 20 the year duration, and eventually settles back at 5.5% in the long run. This demonstrates what happens when you plug a chunk of unusually large returns right in the middle of the data set. You can see that clearly in the Pixel chart. The 80’s were a phenomenal time for the portfolio, and you can see how those hot years fall nicely into many 20-year stretches. But in shorter timeframes the results are more mixed and in longer runs the good times eventually fade a little. The lesson here is that picking a single arbitrary timeframe to calculate the “long-term” returns does not necessarily tell the whole story. 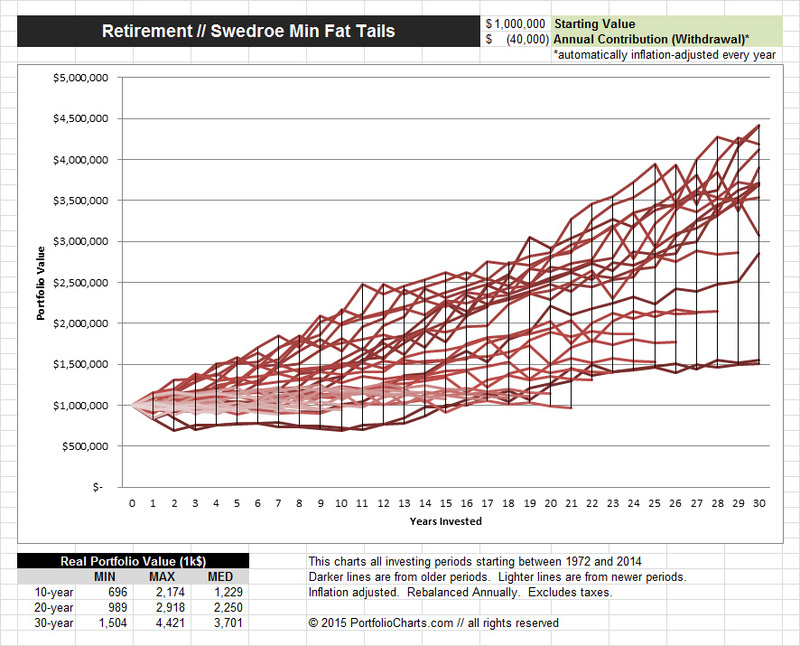 Next, let’s look at the Retirement chart. The upward trend over 30-year timeframes is truly striking– look at all that growth even with a 4% withdrawal rate! However, it’s important to note that the lines are color coded by start date. The darker the line, the older the start date. With that in mind, one can see from the grouping of light colors towards the bottom that the portfolio has seen tremendous growth in the past but has been notably trending towards more modest returns in recent years (although still performing quite well for a retirement portfolio). The lesson this time is that you have to look deeper than the average to get a good feel for where a portfolio is trending. I make no judgement on whether these characteristics are good or bad. Only you can determine the portfolio that works best for your individual needs. I just want to help explain how to interpret these things so that you can use the tools here to their fullest.